These two suppositions are possibly not as inconsistent as they may at first seem to be, for we have a very important analogy to guide us. Consider,, for example, shoemakers wax, or pitch, or asphaltum. These substances at ordinary temperatures are hard, brittle solids. If you drop them, they break into a thousand pieces; if you strike them (so lightly that they do not break), they emit a sound which corresponds to the transverse vibrations of a solid. If, however, we place one of these substances on an inclined surface, it will gradually flow down the incline like a liquid. Or if we support a cake of shoemaker's wax on corks and place bullets on its upper surface, after a time the bullets will have sunk to the bottom, and the corks will be found floating on top. 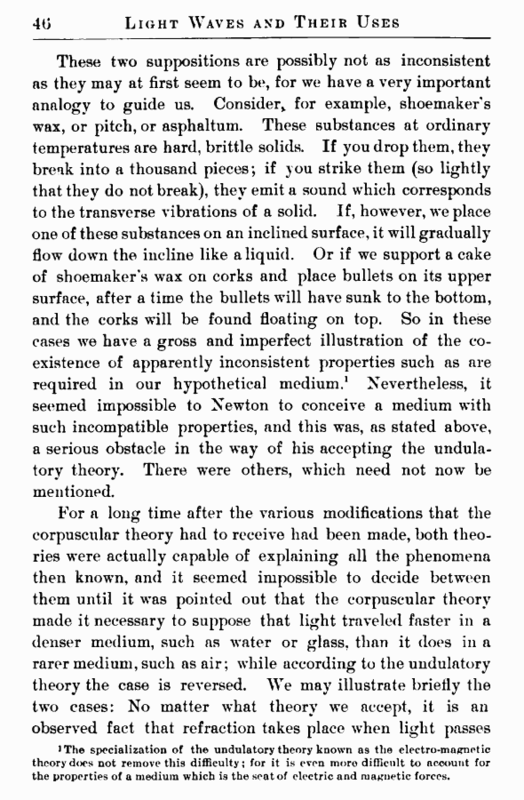 So in these cases we have a gross and imperfect illustration of the coexistence of apparently inconsistent properties such as are required in our hypothetical medium.1 Nevertheless, it seemed impossible to Newton to conceive a medium with such incompatible properties, and this was, as stated above, a serious obstacle in the way of his accepting the undulatory theory. There were others, which need not now be mentioned. iThe specialization of the undulatory theory known as the electro-magnetic theory does not remove this difficulty; for it is even more difficult to account for the properties of a medium which is the seat of electric and magnetic forces. from a denser to a rarer medium, and consists in a bending of the incident ray toward the normal to the surface of the denser medium. Suppose we have a plate of glass, for example, and a ray of light falling upon the surface in any direction. According to the corpuscular theory, the substance below the surface exerts an attraction upon the light corpuscles. Such attraction can act only in the direction of the normal. If we separate it into two components, one in the surface and one normal to it, the normal one will be increased. These two components might be represented by OA and OB in Fig. 41, and the resultant of the two would be 00. In consequence of the presence of the denser medium, the normal component of the velocity of the particle is increased, and the resultant is now 00', which is greater than 00. 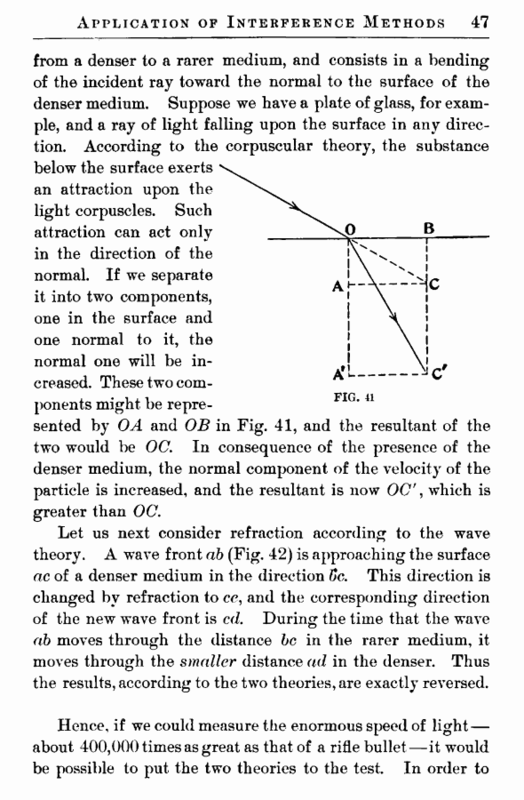 Let us next consider refraction according to the wave theory. A wave front ab (Fig. 42) is approaching the surface ac of a denser medium in the direction £c. This direction is changed by refraction to ce, and the corresponding direction of the new wave front is cd. During the time that the wave ab moves through the distance be in the rarer medium, it moves through the smaller distance ad in the denser. Thus the results, according to the two theories, are exactly reversed.